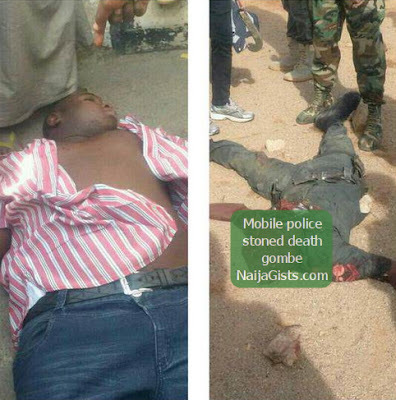 A mobile policeman identified as Adamu Abba was stoned to death by a angry mob today in Gombe after he allegedly shot and killed a Keke Napep (Tricycle) operator who hit his bike. The 38-year-old victim was heading to work on his bike today when a Keke Napep operator hit him by accident at Bello Sabon Kudi junction in Gombe. An argument soon started between the two. Trigger happy corporal Abba reportedly reached for his gun and shot the tricycle operator, 37-year-old Mallam Gana in the stomach killing him on the spot. Adamu Abba quickly took to his heels and ran into the office of Secretary of Gombe Emirate Council for safety when the other tricycle operators descended on him. The angry mob forced themselves into the office of Gombe Emirate and stoned the trigger happy mopol to death before his colleagues arrived. Many residents of the area defended the action of the tricycle operators. lets stp pretendn as if we r among d civilisd nation.dats really a gud measure.y did he run if he does nt value life.d manner in wic dey recruite our security services is really questionabl.dey dnt follow d laydown criteria 4 dr recruitemnt.no painstakn screenin so wot do xpect.if hand ovr uniforms n guns to miscreants,ll dt mak dem polic men! There is nothing like jungle justice here by the keke riders, I love what they did stupid mopol, nonsense. I HAVE NEVER BEEN A SUPPORTER OF JUNGLE JUSTICE,BUT I WILL SAY I GLADLY SUPPORT THIS.MANY OFFICERS IN UNIFORM IN AFRICA AND NIGERIA IN PARTICULARLY OFTEN ABUSE POWER. TREAT PEOPLE LIKE RUBBISH, THEY DON’T EVEN KNOW THEIR LEGAL DUTIES AS POLICE OFFICERS. THIS SHOULD HOWEVER BE A WARNING TO THOSE POLICE OFFICERS WHO ABUSE POWER..MY CONDOLENCE THOU TO THE FAMILIES OF THE BOTH VICTIMS..GOD PLEASE BLESS THIS ALREADY FAIL STATE(NIGERIA)…. Good for him. They see their self as God and untouchable while they’re busy hurting others because they’re in uniform. Nonsense! RIP keke operator.